There is a subtle difference between Invention and Innovation. An invention is mainly when someone describes a new product or process for the first time whereas Innovation happens when someone improves on or makes a significant contribution to a product, service, or process 1. From where I sit, I believe the need is the mother of both, they kind of siblings when it comes to their genealogy. A need that compels individuals or companies to invent and in more than often cases innovate. In the “Accidental Empires”2 book, author explains the several different scenarios how the silicon valley accidents happened which gave rise to the mighty Software industry that we all are part of. Mind you, the author claims those were accidents, not coincidences. These inventions were not accidents, but the accidents caused a void and a need, that gave birth to Inventions. A classic case of failed innovation management is Xerox. Xerox inveted a mouse, they also invented a printer. The management killed that invention in Palo Alto, because they thought, if we give them a printer, nobody will make copies and they won’t sell copiers. Hindsight 20-20, what a foolish decision, eh? Inventions and Innovations both needs to be managed. According to Hammel, a management innovation creates long-lasting advantage when it meets one or more of three conditions: The innovation is based on a novel principle that challenges management orthodoxy; it is systemic, encompassing a range of processes and methods; and it is part of an ongoing program of invention, where progress compounds over time. Three brief cases illustrate the ways in which management innovation can create enduring success. Any type of innovation needs to be managed so that it can be nurtured and brought to life. Some ideas seem most weird in its infancy but can prove to most valuable at its maturity. The innovation takes courage but it is a capability that can promote that courage. There are six essential dimensions of Innovation Management4. 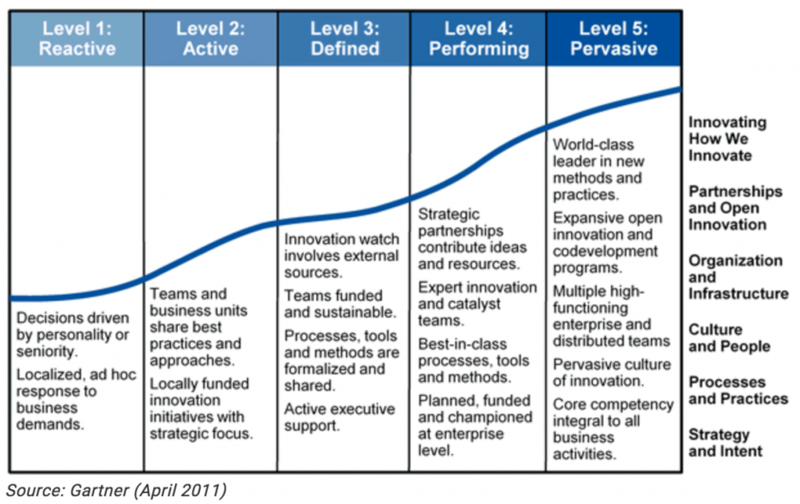 Innovation Maturity Model and its assessment techniques educate enterprises on their own capability to innovate, and succeed in it. The assessment enables them to determine the status of their innovation initiative and measure performance in each dimension to drive innovation predictably and reliably. The framework goes in detail with each level to describe its behavior and actions for improvement. A maturity assessment is the starting point for developing or refining an innovation management competency. An assessment enables enterprises to understand their current state, identify their target state and define the actions needed to progress to the desired levels of competency.